This photograph is of three Barnes brothers from Jackson County, Kansas (from left to right): Jess Barnes, Charles Barnes, and Virgil Barnes. The photo was made in March 1924 in St. Petersburg, Florida. At the time, Jess and Virgil Barnes were major league pitchers--Jess for the Boston Braves and Virgil, for the New York Giants. Charles, also a pitcher, tried out with the Braves during spring training camp, but did not make the roster. 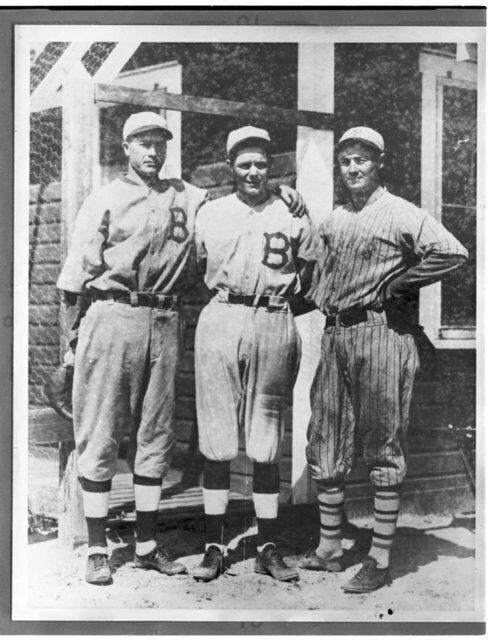 The photo opportunity occurred when the Braves and Giants met in an exhibition game on March 22, although none of the brothers appeared in the lineup that day. The image was published in the April 3, 1924 issue of The Sporting News. Jess Barnes' career spanned the period 1915 through 1927, and involved three different teams--Boston Braves, New York Giants, and Brooklyn Robins. His overall record was 152 wins and 150 losses, with an ERA of 3.22. His best years were with the Giants, where he led the National League in wins in 1919, had two World Series wins in 1921, and pitched a no-hitter in 1922. Virgil "Zeke" Barnes pitched seven full seasons in the majors. He joined the New York Giants full-time in 1922 and stayed with the team most of his career. He had 61 major league wins, and a career ERA of 3.66. He made World Series appearances in 1923 and 1924, including the starting assignment in Game 7 of the 1924 World Series. On June 26, 1924, Jess and Virgil Barnes became the first pair of brothers to oppose each other as starters in a major league game--Jess for the Braves and Virgil for the Giants. Not pictured in the photograph is the youngest brother in the family, Clark Barnes. Clark also was a pitcher who received a tryout at the major league level. Like Charles, however, he did not make a major league roster. The four Barnes brothers and their three sisters were raised in Circleville, Kansas, by their parents, Luther and Sade Barnes. This photograph is of three Barnes brothers from Jackson County, Kansas (from left to right): Jess Barnes, Charles Barnes, and Virgil Barnes. The photo was made in March 1924 in St. Petersburg, Florida. At the time, Jess and Virgil Barnes were major league pitchers--Jess for the Boston Braves and Virgil, for the New York Giants. Charles, also a pitcher, tried out with the Braves during spring training camp, but did not make the roster. The photo opportunity occurred when the Braves and Giants met in an exhibition game on March 22, although none of the brothers appeared in the lineup that day. The image was published in the April 3, 1924 issue of The Sporting News. Jess Barnes' career spanned the period 1915 through 1927, and involved three different teams--Boston Braves, New York Giants, and Brooklyn Robins. His overall record was 152 wins and 150 losses, with an ERA of 3.22. His best years were with the Giants, where he led the National League in wins in 1919, had two World Series wins in 1921, and pitched a no-hitter in 1922. Virgil "Zeke" Barnes pitched seven full seasons in the majors. He joined the New York Giants full-time in 1922 and stayed with the team most of his career. He had 61 major league wins, and a career ERA of 3.66. He made World Series appearances in 1923 and 1924, including the starting assignment in Game 7 of the 1924 World Series. On June 26, 1924, Jess and Virgil Barnes became the first pair of brothers to oppose each other as starters in a major league game--Jess for the Braves and Virgil for the Giants. Not pictured in the photograph is the youngest brother in the family, Clark Barnes. Clark also was a pitcher who received a tryout at the major league level. Like Charles, however, he did not make a major league roster. The four Barnes brothers and their three sisters were raised in Circleville, Kansas, by their parents, Luther and Sade Barnes.